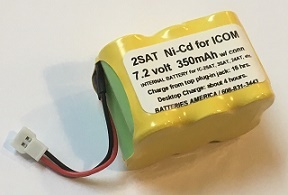 2SAT NiCd: 7.2 volt 350mAh rechargeable battery pack that goes inside ICOM radios such as the IC-2SAT, IC-3SAT, IC-4SAT, etc. Plugs right into radio. Installation of battery is required (you have to open up your radio). These battery packs are manufactured in the USA by BATTERIES AMERICA. 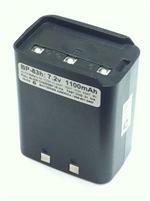 BP-83h : 7.2v 1100mAh rechargeable Ni-Cd battery pack for ICOM radios. The BP-83h is a 7.2volt 1100mAh Long-life rechargeable Ni-Cd battery pack for ICOM HT radios. Replaces BP-81, BP-82, BP-83, BP-84 etc. Fits IC-24AT, IC-2SAR, IC-2SAT, IC-2SRA, IC-W2A, IC-M7, and more. 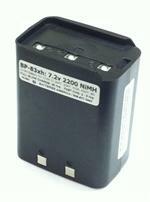 BP-83xh: 7.2 volt 2200mAh LONG LIFE rechargeable Ni-MH battery for ICOM radios. Fits IC-2SAT, IC-W2A, IC-24AT, IC-4SAT, IC-2SRA, IC-4SRA, IC-M7, IC-R1 etc. Replaces original ICOM BP-81, BP-82, BP-83, BP-84.